When BetSoft release a new slot, I generally drop everything and take it for a spin right away. I’m happy to report that Great 88 did not disappoint. You will not find the complexity of some BetSoft slots (it looks great, though there is no 3D animated ‘host’ for example), you will find a beautifully designed game with several different variations on the bonus rounds to keep you engaged. As you might have guessed from including ‘88’ in the name, this is an Asian themed online slot. In the background you’ll see an elaborate pink blossomed tree and old style wooden houses. The symbols on the reels include some classics (firecrackers, dragons, jade frog and so on). There are ‘bar symbols’ which are made up of 1, 2 and 3 level bamboo scrolls – a nice twist on a traditional slot feature. This game has 30 win-lines, and has plenty of smaller wins to keep your bankroll topped up between the bonus rounds. Firecrackers are the symbols to look out for on the reels. These explode when they land, and become wild. You’ll often create multiple wins with these, even in the default one symbol only wild mode. Bonus games are triggered by hitting 3 or more of the lucky red boxes. When this happens the boxes become animated, open up and reveal one of several bonus symbols. 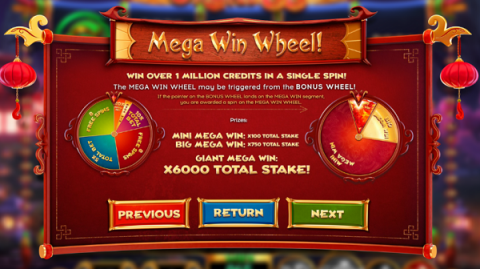 These can be brass coins (which pay a multiplier of your total stake up to 15x), jade discs (or maybe coins) which give you a free spins round, dragons, which are the top paying symbols and will hopefully make up some wins, firecrackers (which explode and make several other symbols around them wild) – or a wheel, which takes you to a wheel based bonus round. The wheel bonus round has two levels. Regular and super. The regular wheel gives you a shot at several other bonus types – the free spins, multiplier and so on. One segment takes you to a super wheel, where you will have the chance of winning up to 6000 times your total spin bet. Where to Play Great 88? This slot is brand new, which means you’ll need to wait a week or so before it appears in the casinos. I checked the usual go-to outlets (Unibet for non-US players and Bovada.lv for US) and it is not there as yet. If you enjoy the Asian themed slots, then Unibet does have the new Dragon Palace slot. They’ll give you 50 free spins along with a 100% match to your first deposit (on Mega Fortune Dreams). You’ll also find many of the wonderful BetSoft 3D slots there. Check out www.unibet.com for more.